In the French countryside, at a sunset soiree, the baguette and brie are placed on the most delightfully carved, mottled grey elm buffet table. 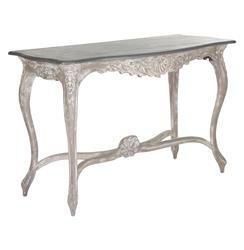 Delicate and distinctive, this vintage console has the perfect proportions for a variety of uses. A dark tabletop contrasts with the lighter, whitewashed decorative legs and complements any romantic room.